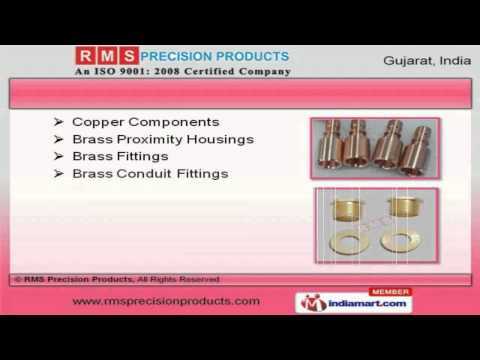 Welcome to RMS Precision Products, Manufacturer and Exporter of Precision Brass Components. An ISO 9001:2008 certified company, incepted in 2005 at Jamnagar. Sophisticated infrastructural facility and Ethical work practices make us different from others. Assured quality products, multiple payment options and highly competitive prices are some of the key factors behind our success. We offer a wide assortment of Brass Components, Gas Parts and Fasteners. Brass Surgical Components, Products and Studs are widely appreciated in the market. We have gained tremendous expertise in providing Copper Components, Brass Proximity Housings and Conduit Fittings. Our Brass Compression Fittings, Heaters and Geyser Components are extremely reliable. We also provide Aluminium Components and Brass Inserts for Plastics Moldings at market leading prices. We are one of the trusted names of the industry engaged in offering genuine quality Brass Hose Fittings, Casting Components and Rivets.